Easy, healthy, and delicious Baked Spring Rolls with Wild Rice, Cashews, Sesame Seeds, Quinoa and Broccoli. Vegan & Gluten-Free. I am in love with rice paper wrappers. Served hot or cold, cooked or uncooked, and with unlimited filling options--they make an excellent addition to any pantry. Whenever I find myself with leftover grains & veggies, I often enjoy adding in a few extra ingredients and off to the rice paper wrappers we go! Top off with a favorite condiment...and yum, there you have it: a fun & quick appetizer or meal! 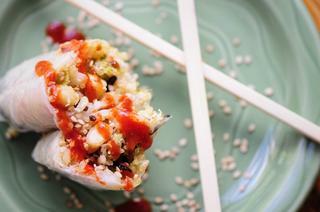 These particular rolls came about when I was looking to add a little protein punch, hence the quinoa & cashews. And wow, were these ever delicious! In a large pot, combine rinsed quinoa & rice, cover with 2 cups water, bring to a boil, cover & let simmer until done, about 20-25 minutes. Salt to taste. Set aside.Toast cashews in a skillet over medium heat in 1 tbs sesame oil until lightly golden. Set aside.Steam broccoli until almost done, then pan fry in 1 tbs sesame oil with garlic, bell peppers & chili flakes until all is tender. Let cool.Combine all ingredients, salt to taste.Preheat oven to 375° F.In a large bowl of warm water, dip one rice wrapper at a time until pliable. Place pliable rice paper wrap on cutting board, spoon a hefty dollop of rice/quinoa mix onto bottom third of wrap. Fold bottom over mix, then fold each side of wrap (one side at a time), then roll all the way up, starting at bottom & tucking tightly as you go. Set aside. Repeat until you have all 12 spring rolls.Brush sesame oil over spring rolls, place on cookie sheet & bake for 20 minutes.Garnish with sesame seeds & sriracha. Or, alternatively, dip in your favorite gluten-free tamari!Enjoy!